The current threat landscape around cyber attacks is complex and hard to understand even for IT pros. The media coverage on recent events increases the challenge by putting fundamentally different attacks into the same category, often labeled as advanced persistent threats (APTs). The resulting mix of attacks includes everything from broadly used, exploit-kit driven campaigns driven by cyber criminals, to targeted attacks that use 0-day vulnerabilities and are hard to fend off – blurring the threat landscape, causing confusion where clarity is most needed. This article analyzes a specific incident – last March’s RSA breach, explaining the techniques used by the attackers and detailing the vulnerability used to gain access to the network. It further explores the possible mitigation techniques available in current software on the OS and application level to prevent such attacks from reoccurring. In this article, I will examine the components used in a wave of attacks that happened earlier this year, first made public by RSA in March 2011. I will also detail the exploit mechanics and explain the possibilities for improving the defense mechanisms. The implementation of these defense mechanisms could have neutralized the attack and prevented the installation of the final malware. I believe these defensive techniques apply to malware and other infection vectors, and should be implemented on a wider scale to prevent attacks. For researchers looking to gain a comprehensive understanding in Adobe Flash vulnerabilities, this article will detail how the exploit works, the vulnerability internals and techniques used in the attack. For security practitioners interested in having access to a better explanation of the incident, this blog will provide a good amount of information as well, since it emphasizes specifics of the attack procedure. The article’s content is divided into six main sections, each one discussing possible workarounds that could have helped prevent an attack. Section 1 – ”General Mechanics of the Attack” explains what the attack was all about, and is a great starting point for those who are not aware of the already public details. Section 2 – “The Email” explains the initial mechanism used to spread the attack, which was an email sent to some specific employees of the target company. 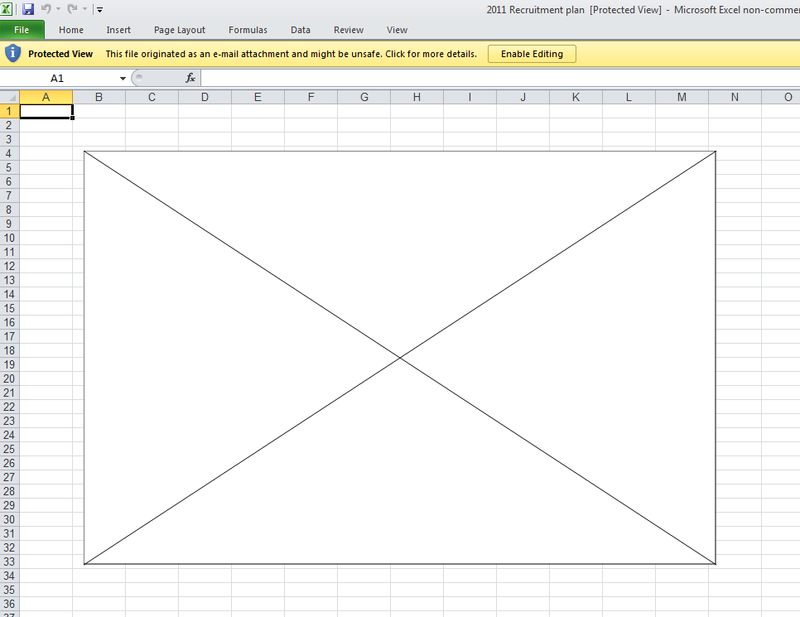 Section 3 – “The Spreadsheet” delves into the spreadsheet attached to the email and the results on the end-user when opening it. Section 4 -“The Exploit” discusses the actual exploit code and its payload (the shellcode, not the final, dropped malware). Next, in the section, “The Malware,” I discuss the fairly generic, straightforward malware used. In the final “Conclusion” section of the article, I discuss possible future trends and ways to proactively protect against attacks. The attack was delivered by an email sent to specific individuals inside the target company. The email contents are going to be further discussed in the next sections, but in essence the email contained a attachment, a spreadsheet intended to be opened using Microsoft Excel. The spreadsheet itself included an embedded Flash object, which was configured to exploit a 0-day, i.e. previously unknown vulnerability in the Adobe Flash Player software, which is now categorized as CVE-2011-0609. Once the Flash object ran, it installed the Poison Ivy RAT (Remote Administration Tool) included inside the Flash object to guarantee further access to the attackers. Poison Ivy has a plethora of capabilities available to its controller such as key-logging, scanning, data exfiltration and other mechanism that are designed to help the attacker to gain deeper access to the target’s network. When this email was received by the mail system, it was classified as SPAM and put into the junk email folder. The email was convincing enough though, for at least one user that moved it back to the inbox for viewing. In the default configuration of Excel 2007, the embedded Flash content is automatically parsed by the Flash player. In this case, the Flash object executed and after 2-5 seconds, the Excel program closed. It is reasonable to assume that an end-user would not notice the quick opening/closing of Excel. In such a case, the user needs to interact again in order for the exploit to work, by clicking on the “Enable Editing” option. Lastly another feature that few users know about, which would have prevented this specific exploit from running, is Data Execution Prevention (DEP). DEP is a security technology that prevents applications from executing machine code stored in certain regions of memory that are marked as non-executable, a technique that is quite frequently used by exploits, for example during a buffer overflow attack. It was introduced in Windows XP SP2 around 2004 as an opt-in feature and can be activated manually through the Control Panel or network wide through a system policy. Either way, once activated it prevents the exploit under analysis from running, as program “a” is attempting an illegal operation. 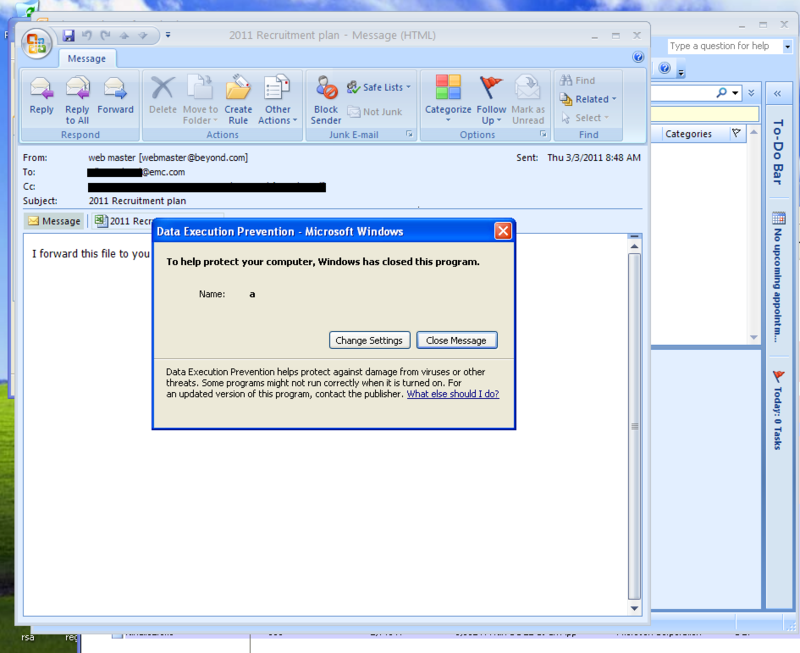 Although DEP is enabled by default in modern versions of Windows, such as Vista and Windows 7, Office 2007 opts for disabling it (calling NtSetInformationProcess()). If set to AlwaysOn or if using Office 2010 on modern Windows versions, this vulnerability would not have run on either of these OSes (as it is going to be discussed later, there is also a dependency of operating system in the shellcode used in this attack). The same Flash vulnerability continues to exist on these systems, but DEP prevents it from executing. The exploit would have to be modified to deal with the more constrained execution environment that DEP provides. Additionally, Windows Vista started using ASLR (Address Space Layout Randomization) which greatly difficulties the ways for bypassing DEP. Most of this section will be related to the actual exploit code and what I did in the lab to trace its execution. To understand the inner workings of the vulnerability, I first reduced the embedded exploit code into a small PoC only containing the minimal SWF file (Flash file) to trigger the issue. Adobe Flash is mainly used to create rich Internet content, for example adding videos and animations to web pages, and it is installed in almost all browsers. But it is supported as well by other content displayers, such as the Adobe PDF Reader and Microsoft Office Excel. Small Web Format (SWF) is the file format used by Flash. Internally, Flash supports a scripting language know as ActionScript. ActionScript is interpreted by the ActionScript Virtual Machine (AVM), currently in version 2, while the newest version of ActionScript is 3.0. ActionScript is basically an implementation of the ECMAScript standardized language. The script source code is compiled into segments to create the final SWF file. Those segments are called ActionScript Byte Code (ABC) segments. Each segment is described by the abcFile structure, used by the AVM to load the bytecode. The division into bytecode blocks depends on the jump targets, defined by the jump operators . To guarantee proper execution of the generated code, the verification step tries to validate proper execution. Most of the vulnerabilities related to Flash are due to mismatching between the verified process flow and the actual execution flow. This will pass the verification, since it generates a safe execution flow. We fail the verification process, since the callpropvoid expects an object and receives an integer. Obviously, if for any reason this passes the verification, we have a security issue. This specific vulnerability is due to the failure of the verifier to identify when the stack state has become inconsistent after a jump to the incorrect position. The next instructions will write to the wrong object into the ActiveScript stack, overwriting memory areas. execution is transferred to that location. 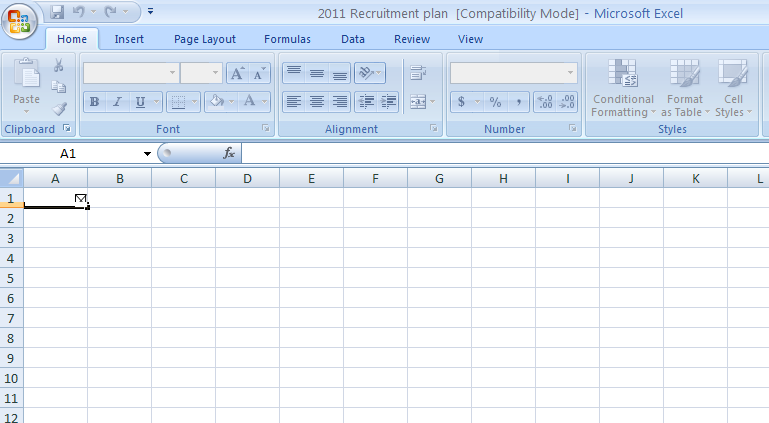 In the case of the exploit at hand, the first step was to isolate the swf file in the Excel spreadsheet. 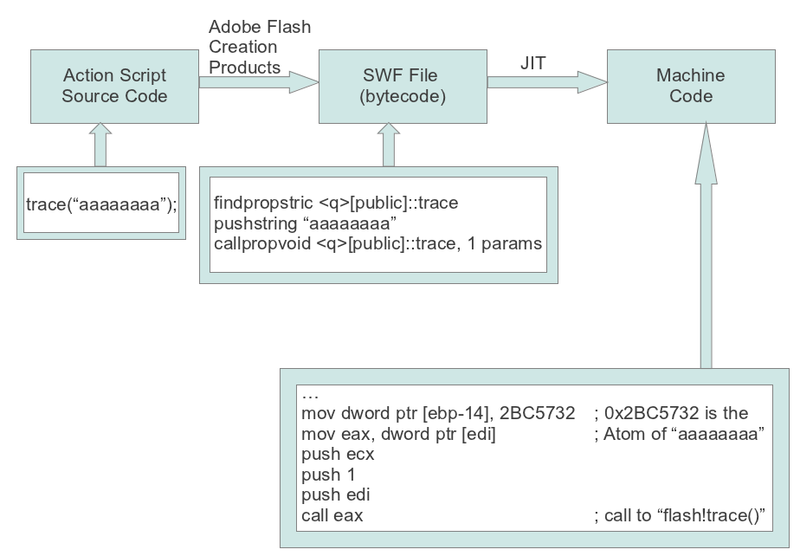 Embedded Flash code is then spraying the memory and loading another flash file in the same context to trigger the vulnerability. The shellcode in use by the exploit uses a known technique for finding the kernel base (it does not work in Windows 7 and thus the exploit code will not work against Windows 7 platform) . The malware used in this case was fairly generic, most likely chosen by the attackers for its functionality and ability to evade detection by popular AV tools. It was a version of Poison Ivy, which is a RAT tool providing complete control of a victim’s machine, allowing installation of more software, monitoring of keystrokes, and other network reconnaissance activities. The malware, a version of a toolkit available since 2005, was configured to connect back to the mincesur.com domain at good.mincesur.com. This domain had been associated with malicious activity before using names such as download.mincesur.com, good.mincesur.com, man.mincesur.com and in connection with domain wekby.com (hjkl.wekby.com, qwer.wekby.com, uiop.wekby.com). This is a good example of the importance of outbound traffic control as a security measure since those domains had been identified as malicious even before the attack by a number of security companies. It illustrates the need for a fast and reliable information exchange schema so that such domains can be blocked as soon as possible. While I investigated an exploit on Adobe Flash, the sheer number of software installed on modern machines in network environments opens the door for similar attacks. The complexities of typical software packages create a huge attack surface, a fact that has been repeatedly utilized by exploit writers. Modern defense mechanisms exist to impede the success of such attacks. They create a barrier by elevating the technical difficulty of the attack. There is a tremendous opportunity for IT pros to turn the tables on the attackers and increase the cost of the attack to a level where all but the most determined attackers will fail. This covers the great majority of attacks, including automated attacks and those re-using previously delivered exploit codes. I would like to thank Mikko Hypponen from F-Secure for sharing the emails they found related to this attack. Having access to trusted sources for the data to be analyzed is very important for a technical report. Special thanks also goes to Wolfgang Kandek, Qualys CTO, for giving me the time to work to understand the technical underpinnings of the attack and for helping me with reproducing each step. This is very time intensive part of the setup where multiple virtual machines are needed to cover all possible scenarios. Great technical feedback and corrections by Sean Larsson from Verisign iDefense and Timo Hirvonen from F-Secure made this article more accurate and informative, thank you both. Li, Haifei; "Understanding and Exploiting Flash ActionScript Vulnerabilities" CansecWest 2011. It’s interesting that the strategy of such attack was relied on social engineering. It demonstrates that even a company with expertise in security products always needs campaign and recycling about security policy. Another interesting point is the lack of filter the outbound traffic. Great article. – The attachment contains an excel spreadsheet (no links, executables and others that we constantly teach people to not open). Regarding the outbound traffic I believe they have outbound filtering, the matter is they didn’t knew at the time the domain was bad. It was known for a small number of security companies. This demonstrates the lack of communication in the security industry and the need for better community-based approaches in defense. I’m really glad with all the feedbacks we are receiving regarding this post. One important update, thanks to my friend Sean Larsson from Verisign iDefense is regarding the comment on upgrading to Windows 7, since Office 2007, even on Vista/Win7, does not have DEP on with the default vista/7 DEP setting (which is /OptIn). This is why a bunch of the older Flash 0days were embedded in Excel/Word files. The attacker does a heap spray in actionscript to make ASLR not matter, trigger a flash vuln, jump to the heap and game is over. 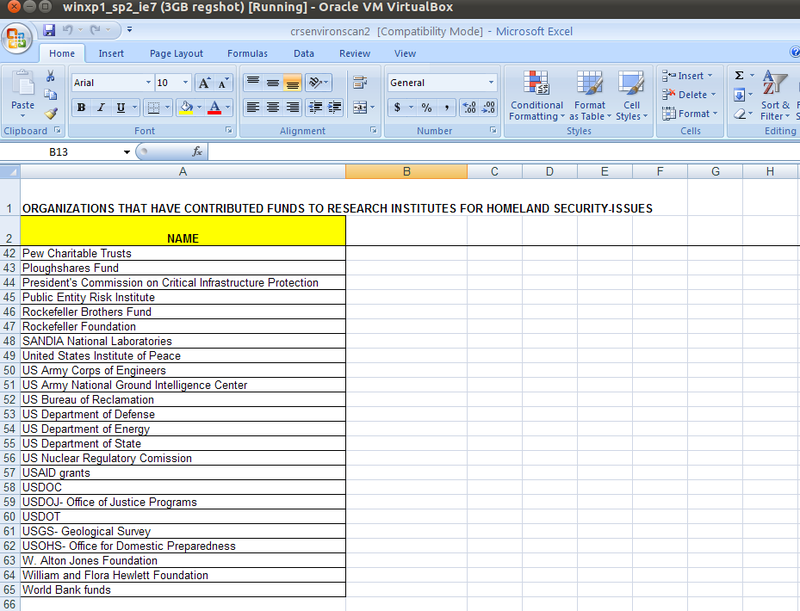 The default policy on Vista/7 is OptIn, and Excel doesn’t OptIn via any method. 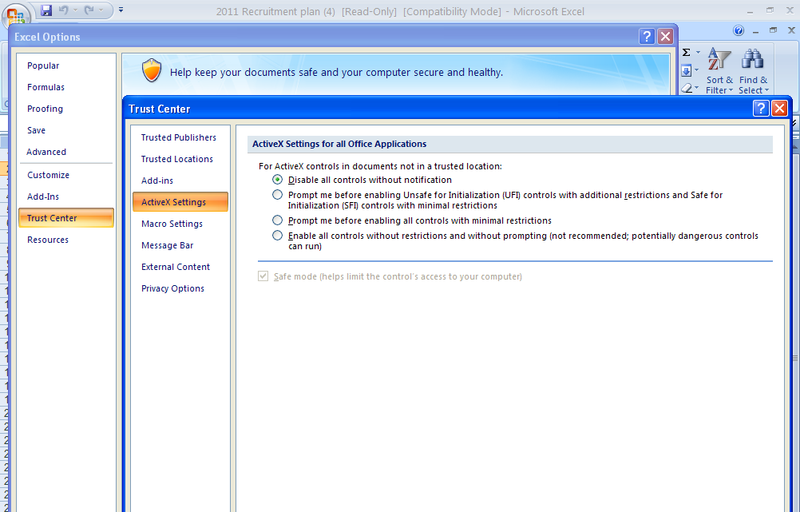 An important addition is also in the fact that even if you change it to /OptOut, Office 2007 will turn DEP off. The only option in this case is to set DEP to /AlwaysOn. Again, thank you very much Sean for the invaluable input. Additional comments are always welcome and I’ll keep update the article as much as possible. First of all, congratullations for you post. I’m new in this area and I’m trying to learn as much as I can about finding vulnerabilities, malware analysis, and so on. It’s always nice to find good readings like this. I received great feedbacks and decided to apply all the suggested corrections directly into the article.